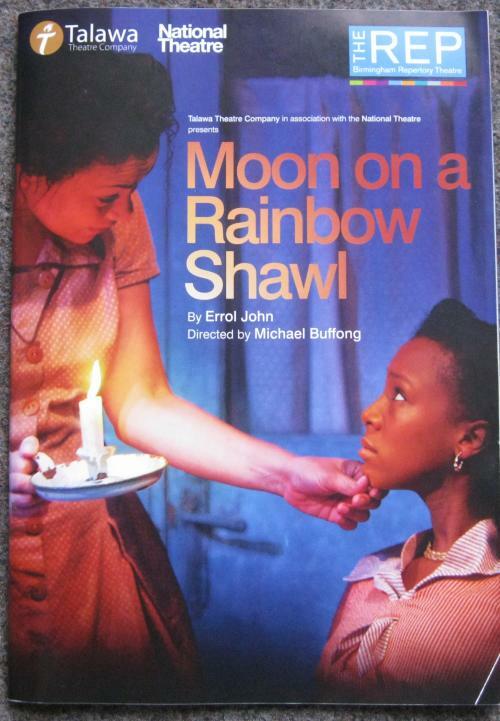 I went to the matinee production of Moon on a Rainbow Shawl, a surprise gift from a friend. I had never heard of the play and was unprepared for the effect it would have on me. Not surprising that it won the Observer New Play competition in 1957 and was staged the following year at the Royal Court Theatre in London. The story line is strong and the acting superb. Set in post war Trinidad the play touches on the lives of a group of people living in a slum yard, and their desperate and often humorous attempts to find a way out. Martina Laird was so realist as long suffering mother; wife and confidant Sophia Adams that I’m not afraid to admit that I wept open tears. I was also weeping because I was witnessing more beginnings of absent fathers – a subject I’ve written about in my latest book Love is Not a Reward. Moon on a Rainbow Shawl is finished in Birmingham now but is touring and can still be seen in Malvern, Watford, Oxford, Cambridge, Bath and Colchester. Do yourself a favour and go see it. It’s really given me the urge to begin my piece for the stage. After months of non-fiction writing I’m desperate to get back to the creative stuff. Awwwww that sounds like a really good play to watch … unfortunately I am not even close to the UK right now otherwise I would have definitely bought a ticket to see it.